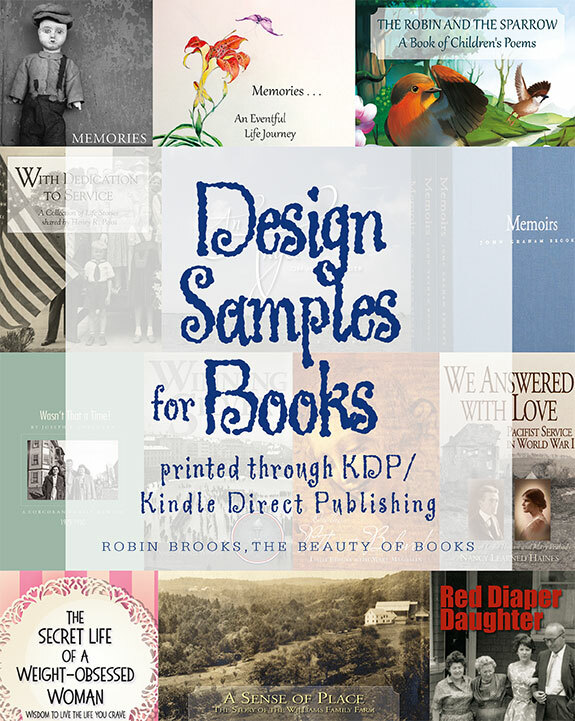 This is a booklet Robin put together to test the quality of color printing with KDP/Kindle Direct Publishing (formerly Create Space). It was first created for her own knowledge and then so that she could advise her clients to the best of her ability. It begins with a smattering of chapter opening designs which are followed by several pages of black and white, color, and false duotone images. Robin Brooks of The Beauty of Books works with high-end offset and short-run digital printers, as well as the print-on-demand (POD) services of Ingram Sparks and KDP/Kindle Direct Publishing (formerly Create Space). This means that you have the flexibility of a traditional offset printer for a large print run, an excellent digital printer for a small run, or true POD for those books you'd like to get out into the world and on Amazon economically. Every year Robin seems to have at least one goal that she sets for herself in terms of adding to her knowledge base as a book designer and guide. Several years ago she got so fed up by needing to scramble for which printer could do this, which could do that, which is right for this specific book or that one, she finally conducted a formal and comprehensive search for the best printers in each class that could — together — fit her and her clients' needs. Now, no matter what the project (barring something very unusual??!! ), Robin has at her fingertips the names and scope of all the printers she needs—printers she can trust to do the best job possible for her clients and their books. She is happy to act as a guide for you in this area of creating your book.